#4 in our series: Meet the Team! Here's Seth Wispelwey. On the Government Relations & Advocacy (GRA) team at IJM, we are always interested in getting to know you and talking about how you can get involved in the fight to end slavery, but we realize that it might be nice for you to get to know our team, too! So, we’ll be doing a little blog series, featuring Q&A with each member of the GRA department. This will be your backstage pass to our legislative and advocacy programs, and an opportunity to learn more about the men and women who make up the team. How it will work: Clara Campbell, GRA's Online Campaigns Manager, will interview each of the members of the team. There will be a mix of serious and fun questions, and ideally, after reading each post, you'll feel like you have a better idea who we are. Meet Seth Wispelwey, Organizing Director - East. Q: What does being an IJM “Field Organizer” mean? Tell us a little about your job. A: I work to build and convert public will into political outcomes and policies that effectively address everyday violence threatening the global poor like modern slavery, human trafficking and sexual assault. I share with folks that their voice and vote as U.S. citizens can produce these outcomes. Practically, that means lots of email, phone calls, coffee meetings and generating the occasional well-placed Letter to the Editor. Q: What brought you to this work? A: I’ve been an organizer for a decade now and counting, engaging a variety of (often related) issues: AIDS, poverty, hunger, food policy, trade justice, and now IJM and the urgent issues we address. What brought me to this type of work were deep challenges to my faith and a felt urgency around these big modern crises, combined with a personal passion for building relationships, participation and unity around meaningful stories and opportunities. Q: In your job, you travel a lot. What are your personal top three cities to visit in the U.S.A right now? A: Austin, San Diego, Portland (Oregon). A: Be confident and kind. Ask questions and listen. Find common cause, and create a shared endeavor out of that. If it’s meant to be a good connection, the rest will follow from there. Q: Where do you call home? A: My family and I live in and love Charlottesville, Virginia. I grew up here, went to college here, and moved back in 2013, after a decade away. However, Austin was the first ‘adult home’ I made for myself, and a large part of who I became grew there…it’s hard not to slip into calling that a spiritual home. But Charlottesville is an amazing place to grow up and raise a family – and is more and more becoming the ‘Austin of Virginia.’ A special place. Double bonus. Q: What’s your favorite kind of music? A: The good kind. Haha. All kinds. I make regular mix CDs for my family – our ‘Seasonal Life Karaoke’ so to speak, that are designed to be a bit of a ‘time machine soundtrack’ for the chapters, trials and triumphs of our lives. The attribute they all share is that they have to work as a ‘road trip mix’ too – meaning they have to be a consistently engaging listen. They’re fun to do and I get my musical boundaries stretched in doing them. My Sharpie art skills have also become intense after about six years doing them. If pressed to make a specific recommendation, I’d really want anyone reading this to experience the records of Balmorhea – friends of mine from west Texas and Austin who produce some of the most hauntingly beautiful experimental instrumental music…they’ve truly become a ‘soundtrack for my life’ (and often my workdays), as the ‘play count’ in my iTunes will attest. Check them out, and be transported in deeply moving ways. Q: If you could take a Do-It-Yourself class, what would you learn to do? A: I’d learn how to build my own eco-friendly energy efficient home. Q: Mountains or beach vacation? A: Beach, beach, beach. Growing up, I went with my family to the Outer Banks (North Carolina) every summer, and I was raised on the east coast. I’ve only done it a couple of times and yet snorkeling is an all-time personal highlight. One of the best birthday presents I ever received was a year-long ‘adoption’ of a Humpback Whale (2nd grade – her name was Penny) that supported conservation efforts. You get the idea. There’s something about the oceans – they’re constant and eternal, and also roiling and transitioning in constant motion. That seeming contradiction carves out deep reservoirs of peace for me. There’s probably a sermon in there. I do love the mountains, and I married a Colorado girl, so that probably makes our ideal vacation a ‘compromise’ of California coastline magic! 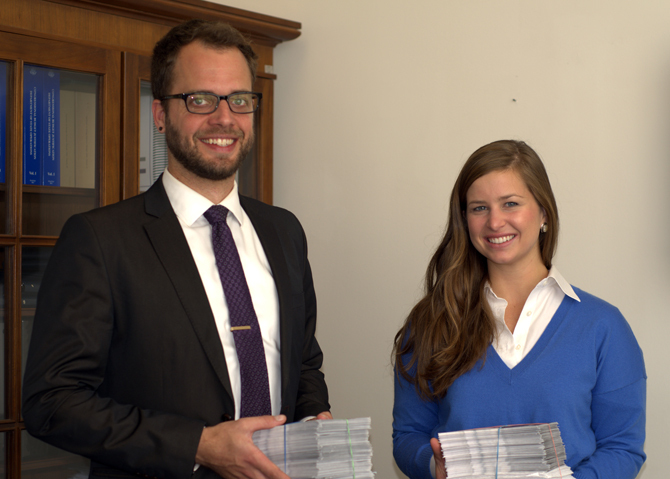 Seth delivers stacks of postcards from New Jersey advocates to the office of Senator Menendez (D-NJ). *Top image: Seth Wispelwey speaks at a rally in Nashville, Tennessee. Get to know the other members of our team by reading our other posts in this series! Meet Melanie Beilfuss - Melanie is sadly no longer with IJM, but Government Relations & Advocacy Vice President, Holly Burkhalter, has a new Executive Assistant. Her name is Opa Owiye; look out for more about her soon! Turning public will into political outcomes. 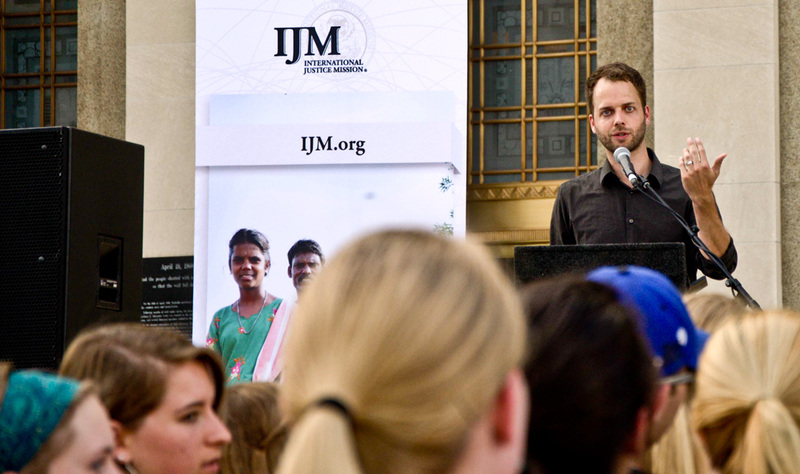 Meet Seth, IJM Organizer.